EMF radiation can be classified from very low frequency (long wavelength) to very high frequency (short wave length) as show below. These EMF are also classified as non-ionizing and ionizing. Ionizing EMF radiation can break chemical bond (cause cell damage) and is of immediate threat to health. 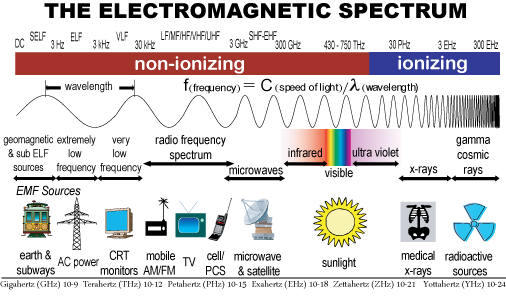 Examples of ionizing radiation are UV rays and X-rays. EMF radiation can also be divided as Natural or Man-Made. Natural Radiation can include the negative earth radiation generally classified as Geopathic Radiation or Geopathic Stress. Man-Made Radiation includes all technical equipment or devices that produce Electromagnetic Fields. Example are the power lines, radar systems, communication towers, cell phones, cordless phones, WiFi router, TVs, computers, gaming consoles, etc. Infact, any device that runs on electricity will produce EMF radiation. All EMF Radiation will have an effect on the human body. The question is whether its a positive effect or a negative one, and to what degree.